1. Domicile, Legal Residence : مستقل رہائش : (noun) (law) the residence where you have your permanent home or principal establishment and to where, whenever you are absent, you intend to return; every person is compelled to have one and only one domicile at a time. 2. Domicile, Domiciliate, Reside, Shack : سکونت کرنا - قیام ہونا : (verb) make one's home in a particular place or community. Rusticate - live in the country and lead a rustic life. 3. Domicile, Abode, Dwelling, Dwelling House, Habitation, Home : گھر - رہائش گاہ : (noun) housing that someone is living in. The South African law of domicile of natural persons. Domicile, residence and UK taxation. Domicile: Webster’s Quotations, Facts and Phrases. Every : ہر : (used of count nouns) each and all of the members of a group considered singly and without exception. "Every person is mortal"
Abidance, Residence, Residency : رہا‏ئش : the act of dwelling in a place. Whenever : جب کبھی : At whatever time. "We can leave whenever you are ready"
Domiciliate : بسانا : provide housing for. Domestic Fowl : گھریلو پرندے : a domesticated gallinaceous bird thought to be descended from the red jungle fowl. How this page explains Domicile ? It helps you understand the word Domicile with comprehensive detail, no other web page in our knowledge can explain Domicile better than this page. 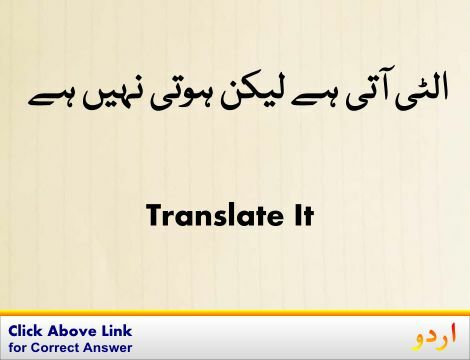 The page not only provides Urdu meaning of Domicile but also gives extensive definition in English language. The definition of Domicile is followed by practically usable example sentences which allow you to construct you own sentences based on it. You can also find multiple synonyms or similar words on the right of Domicile. All of this may seem less if you are unable to learn exact pronunciation of Domicile, so we have embedded mp3 recording of native Englishman, simply click on speaker icon and listen how English speaking people pronounce Domicile. We hope this page has helped you understand Domicile in detail, if you find any mistake on this page, please keep in mind that no human being can be perfect.